Tagged under Tamiki Wakaki, Manglobe, Series, Light Novel. Despite it's heavy resemblance to the Manga , it is actually really entertaining even if it's watching the same thing again since the developers have actually done a lot to emphasise on the artwork and music of the Anime. Though not particularly story-oriented , this Anime features unique and captivating ( Well , probably too strong of a word , but no matter :P ) short stories which ends with a beautiful conclusion. Naturally , this Anime is further supported by the presence of humor relief which further lightens the mood of the viewers. This was a very good anime!Every character has a unique personality were is easy to trace why is going to happen but that is for the audience.It was fun to see a character that also notice this little personality traits to fill the emptiness of the heroines heart. The plot got better with each season and the manga gets so much better. The plot didnt bored me at all. It took many common themes and made it into a well equally balanced love comedy! I like the main character's personality, its not the typical boy who has "something" like a magnet that attracts every girl in an entire place, instead he has to win the girls hearts by working hard ^^'. It can be boring sometimes because of the repetitive search of lost souls, but its funny enough to keep watching. while the main story and the plot is interesting, plus it's about someone who plays games a lot, this is quite watchable. though the whole episodes itself turns out to be pretty much the same and somewhat quite boring because of the same purpose (to make the girl fall in love), only in different ways/approaches. 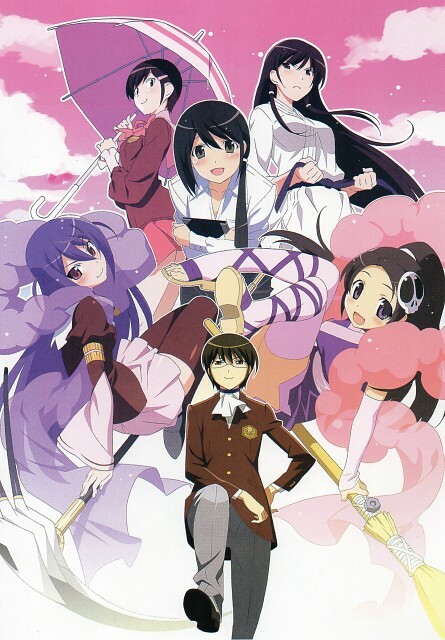 Either way I never thought that this anime turns out to be very good, although it sounds simple but it really is a difficult thing when we try to capture or getting close to a girl, and it somewhat amazes me of how Keima managed to turn the tides no matter how worse the impression he has made to the girls and he managed to turn it into them loving him. Not the usual harem anime that people have come to known. The plot becomes more interesting and enjoyable because the main character is a Sim Date gaming god that hesitates to deal with anything that involves the real world. The personality of the main character brings unique conversations and situations into the anime that is not seen anywhere else. Very good, very promising anime. Not any harem anime (manga) I've ever seen. Mainly because of the hesitant protagonist to real world's girls, which brings quite the uniqueness and curiousness to the progress of the story. Probably, if I might say, TWGOK is almost the same to School Rumble in terms of character relations and great many other things. Definitely a promising series.